This view of a humpback whales lunge feeding is from the top of it’s head. One can see the baleen hanging down over the lower jaw. As the mouth closes the water is forced out through the baleen and the herring are trapper inside to provide another meal. These whales have become common in out viewing area so we often see eight to ten different whales on a viewing day. However in this case you can see the wash from the boat so we were moving when the pacific white sided dolphins came to play. There were a number of pods is our area this summer. Confusing is the definition of a pod: “A group of dolphins is called a pod. A pod usually is formed of around 12 dolphins and it is the usual social group of dolphins. 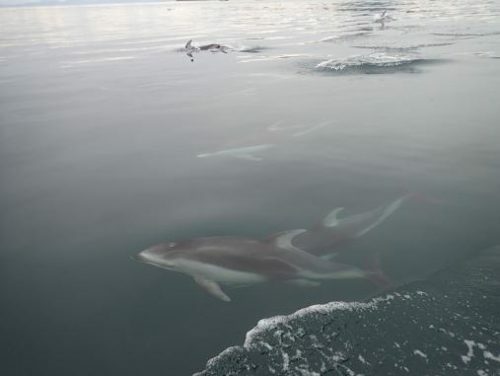 However, when a group of pods join in places with abundance of food, they can reach up to one thousand individuals forming a large group which is called a super pod.” The confusion it that our pods normally contain between fifty to one hundred dolphins which may be a result of the “abundance” of food in our viewing area. 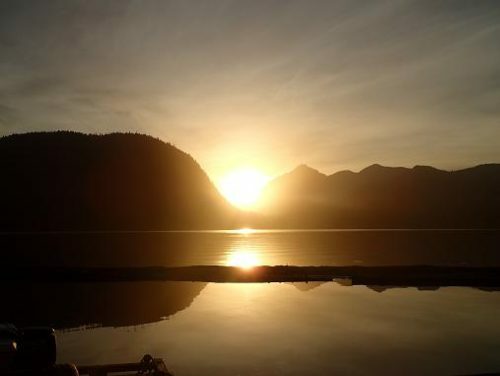 It is a good thing that there has not been a law passed about taking one handed photos while driving a boat – or I would miss some of my better opportunities. 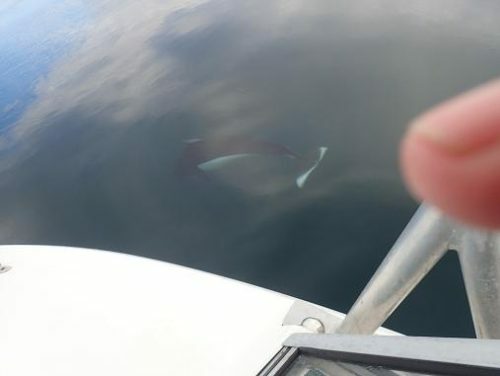 This is a dall’s porpoise that came to visit while we were waiting for a humpback whale to surface so I really was not driving…. I always try to find an interesting location to eat our picnic lunch on a whale watching tour. 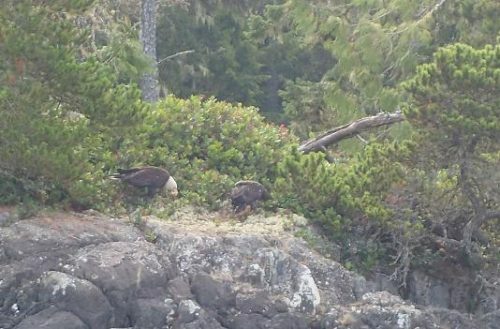 This day it was with a mother bald eagle that had just caught a small salmon and was sharing her catch with this years offspring. When any animal / bird has food and you are not intrusive they tend to ignore your presence so we enjoyed watching this exchange of food for about thirty minutes. 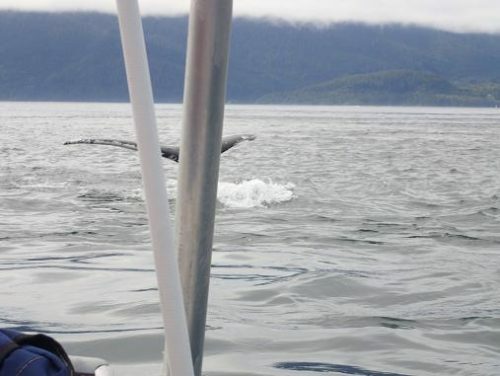 In this case the boat’s antenna helps to obscure the humpback whale fluking, however the intent of the photo is again to show that on occasion we do get close to that we are viewing. As the guide and picture taker it is often a “shot from the hip” rather than a planned and timed photo. Guest safety is number one priority over a good photo. This is to be a grizzly bear family that is together for it’s third summer. 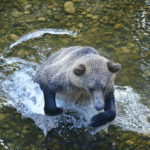 It is one of the cubs that caught the salmon the mother is on the right. Not sure what has her interest as we were sitting in our skiff about forty meters in front of the cub with the salmon. Actually the guests were in the skiff I was sitting on the bow of the boat holding it in place on the river. 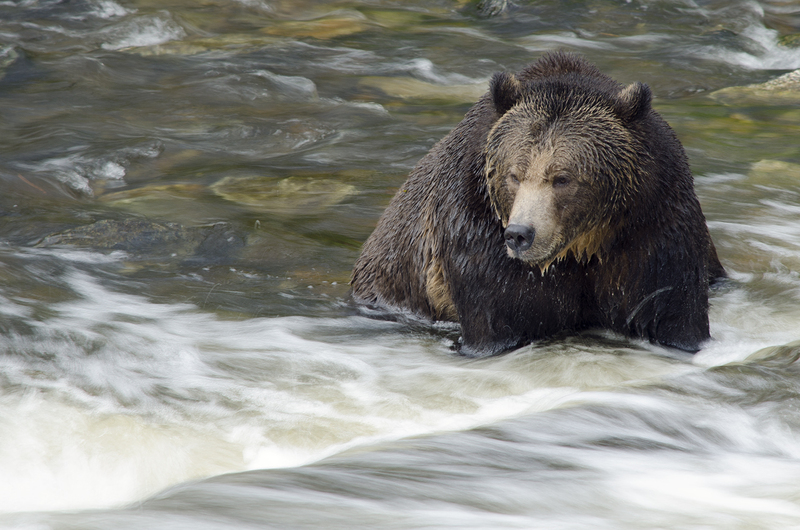 The grizzlies did turn and cross the river to eat the salmon but also came back to catch several more while we watched from front row seats. 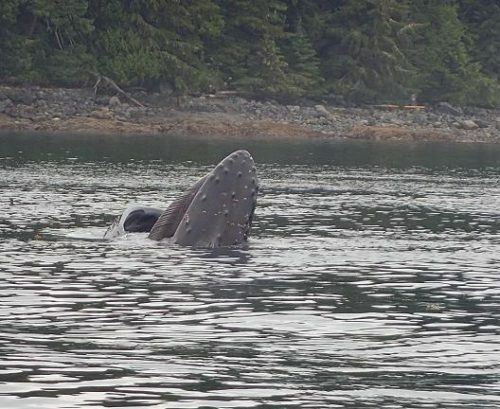 The only time we got their attention was when I stood up to move the skiff away from their fishing area and the mother stopped and looked our way. I sat down and she went back to fishing. We are part of the background as long as we play by the rule – Do not move. 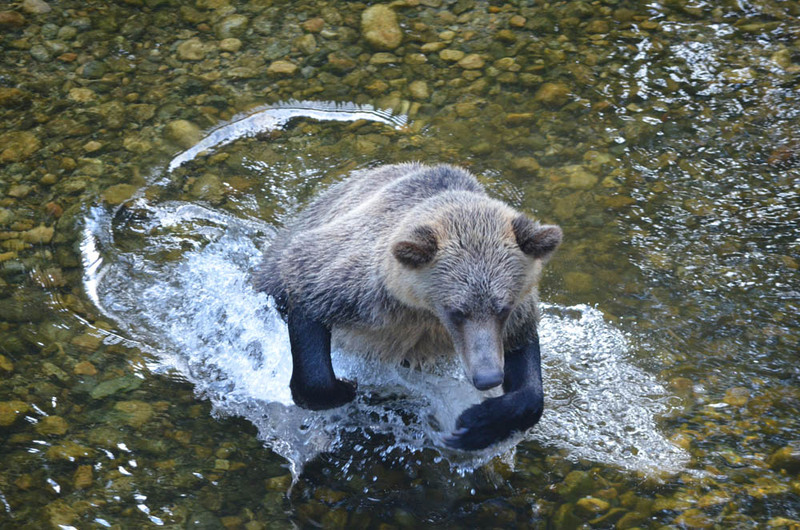 Grizzly Bears all seem to have their own fishing style. 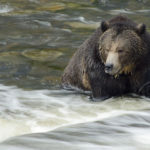 Often the larger, more mature bears are far more patient opting to let the calories come to them rather then run around burning calories in hopes of maybe catching a salmon. This bear sat for two hours picking off the occasional pink salmon as it swam by. Initially just due to the bears size we assumed it was a male. After a “better look”, however we discovered that this is in fact a very healthy female Grizzly. The Coast Mountains in the background make for a memorable flight to the Lodge from Campbell River. For many guests it is their first flight in a small plane. For some it is a “white knuckle” flight while others could do it every day. 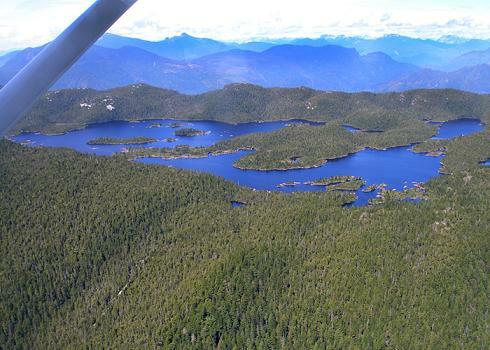 Keep a camera handy, as you will be flying for about forty-five minutes over nothing but a beautiful landscape that will give you some idea of the vastness of “Beautiful British Columbia”. Fabulous time from start to finish. Made very welcome by our guides Angus and Glen. Food was wonderful and thanks to Madeline for that. We saw plenty of wildlife, including black bears, eagles, orca, seals, sea lions, porpoise and humpback whales and last but not least a family of Grizzly bears! Glen was a great “spotter” and very good at what he does! Lodge and amenities very comfortable.